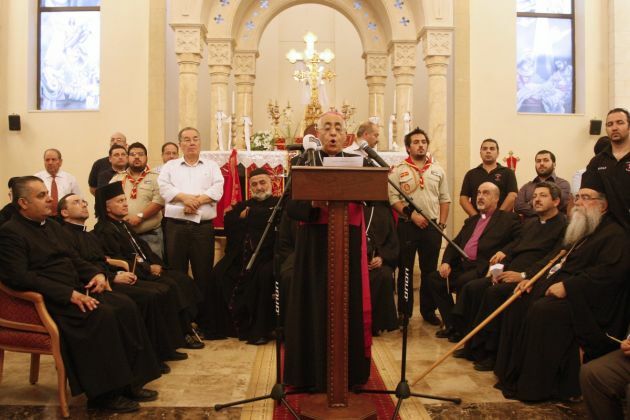 (Photo: REUTERS / Majed Jaber)Jordanian Christian clerics hold a mass at the Syriac Orthodox Church in Amman May 21, 2013. Hundreds of Christians gathered to demand the release of the two bishops of Aleppo, Yohanna Ibrahim (Syrian Orthodox) and Paul Yazigi (Greek Orthodox), a month after their abduction. BUSAN, South Korea - The World Council of Churches has demanded the immediate release of two Orthodox archbishops from the Syrian city of Aleppo, kidnapped seven months ago. The WCC also includes in their statement, "The Worldwide Christian community affirms that the continued presence of Christians in this region is indispensible for plural and diverse communities, and commits itself to accompany all in the building of democratic civil societies." The WCC demanded the release of the two archbishops and also called on its 345 churches "to express costly solidarity with Christians and churches in the region." "The ongoing and longstanding Palestine/Israel conflict in the region, and the Israeli occupation of Palestinian and Arab territories since 1967 remains the core problem that is fueling the logic underlying many of the conflicts in the region, putting at risk international relations and peace," the statement said.